This MoonTide forecast showed a thrust, a congestion, another thrust, and another congestion. The 1ADay trade was set up to go with the trend after the first congestion. 1. 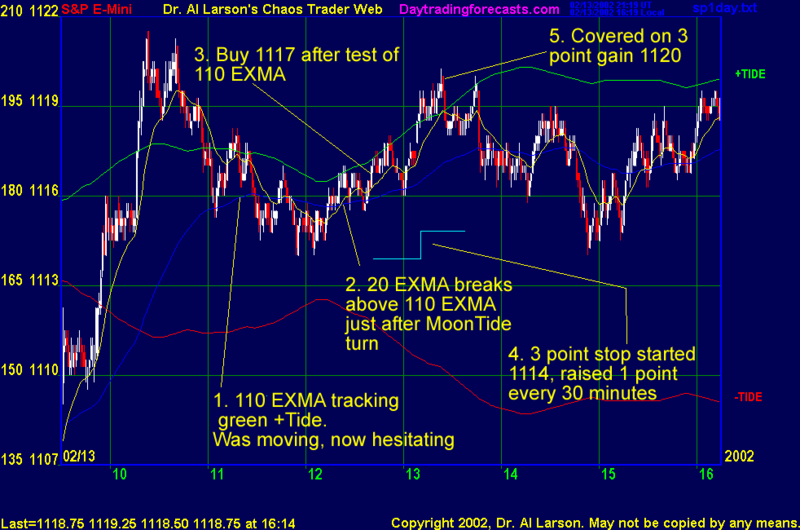 Watch for the market to congest going into 12:00-12:30, then set up a trend, as indicated by the 110 Min EXMA. Wait for the 110 to curl over if flat, or hesitate if moving, and for the 20 EXMA to cross it, or dip toward it and then go with it. Plan to trade in the direction of the trend. Enter when the new trend is clear. 2. Place a stop 3 points from entry. Move it 1 point for each 30 minutes past entry. 3. Cover on a 3 point gain, at 2:10, or when stopped out. Trade A was good for 6 points, only twice as much money for a much longer risk period. By taking just the 1ADay trade, we made more money per unit time at risk. Again, Forecast, Plan, Track, Trade worked.